Ted wanted to play the BRIDGE in the original key of D, so how to get back there without anyone being the wiser? Ever drawing from the Masters, he told me about the pickle he had gotten himself into, and HOW he got out of it. He had obviously modulated up a major third, (diminished 4th, if you must!) and to go back to D from Gb would have to modulate again up a minor sixth. AS IT SO HAPPENS…there is a common device known as a DECEPTIVE CADENCE. “What is that?” young grasshopper asked (stupid me), and Ted replied that it is commonly defined as a V to vi in major or V to VI in minor, so named because the ear is accustomed to hearing a I (or i ) after a V chord of some sort. He proceeded to play a “simple” example from a Bach Chorale, something like the example. Then he showed me the passage, which I have boxed and marked in the next example, which is an excerpt from the recording. Notice that the Db9 chord has an Ab in the bass, which provides a nice, smooth elision to the D/A to G/A to A7 to get back to the bridge, now in D, and the listener would indeed hardly notice! Please also note the use of “barbershop” harmony, which Ted did like, between the B minor chord and D/A, which is a Bb7+/Ab (all implied with only 4 voices) which we agreed was easiest to name a bVI7, although it is actually (hold on to your hats…) an Augmented 6th chord, which is quite a story best left for another day, but for now, even though in actual practice they are spelled weird, they SOUND like a seventh chord on the bVI degree. And, that is hard enough! 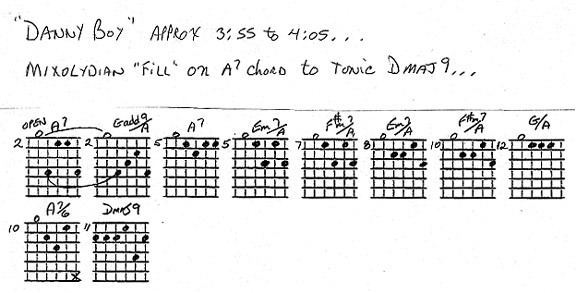 Ted explained that these are chord scales, and he used to hand-out sheets with chords to start from, and you were supposed to first work out the pattern up and down the neck, make music out of them, especially useful in improvising an intro, interlude between something, an ending, or whatever you want. Here Ted is starting way up high in D with the iii7 chord (F#m7), voiced with the 5th in the bass, and works his way down by scale step, where after the Dmaj7, instead of playing the Em7 he slips into the key of A major by making the E chord an E7, continuing by step descending ii7 V7 of A to another descending chord scale in D with A pedaled in the bass to heighten the A Mixolydian effect, landing at his target of A7at the 2nd fret, where he picks up the tune. Ted responded that he basically thinks of this as a fill, much like a single line player might think of a solo cadenza or something, and that it again uses Mixolydian sounds. 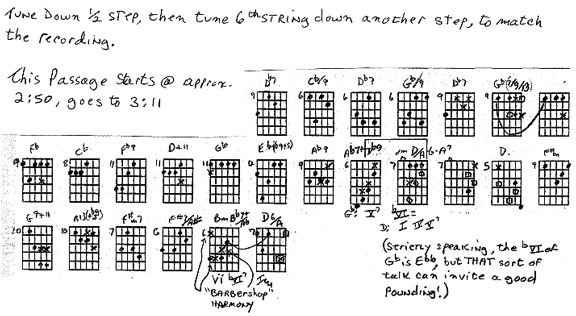 What’s actually going on here is nothing more than an A7 chord going to D. Ted starts out with an A7 chord, as you can see, and ‘fills’ it in with A7’s closest buddies…Em7 going to F#m7 (which is also an A major6) to another inversion of Em7, F#m7 to another G, with EVERYBODY being pedaled over an A, which sort of keeps reminding our ear that we are in the A Mixolydian mode. Another way of achieving these sounds in a ‘fill’ situation is to play a closed voiced triad chord scale in D over the open A string, similar idea to the first example. If you want to really concentrate on heightening the Mixolydian flavor, just try alternating the A and G triads, and it will get you there. Yet another way, in a very similar vein, would be to simply alternate the A7 chord with the minor7 chord whose root is up a 5th from the 7th chord in question, which would be Em7, and sort of flip them back and forth going up and down the neck. This is where the Voicing Group 2 inversions that Bob Holt posted come in handy (see Harmony & Theory-Changing Qualities), for those who haven’t checked them out. 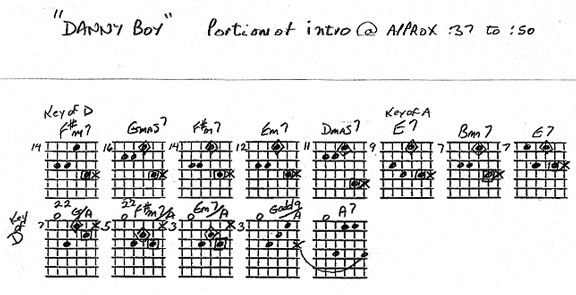 Ted told me that this concept was widely used by Wes Montgomery and Claude Debussy, among many others. AND…Don’t forget to try alternating the Em7 with Em6, also known as an A9 (no root)! I did actually ask Ted about the London Bridge tagline, and he told me that he thought of the fact that Danny Boy is also known as "Londonderry Aire", hence, the London reference. Don't forget to check out "Modern Chord Progressions". He touches on the subject here as well.